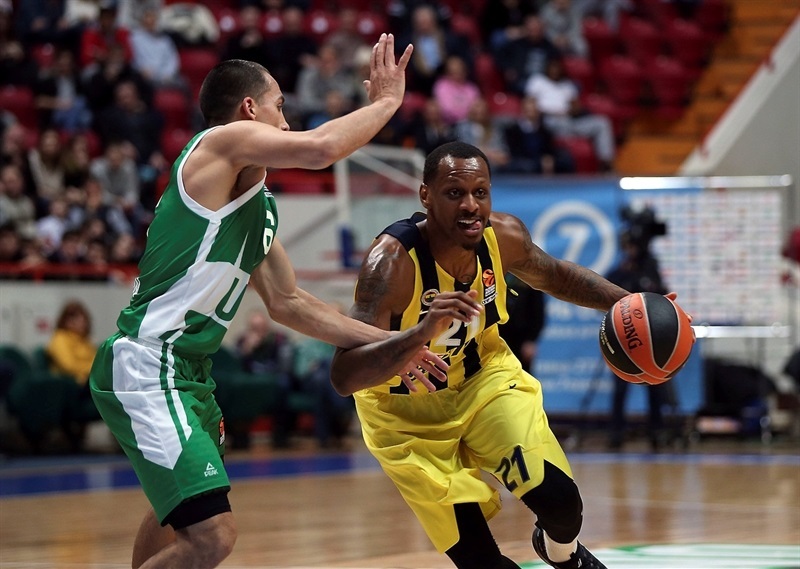 Fenerbahce Istanbul held off Unics Kazan for an 81-86 road win on Tuesday at Basket Hall. 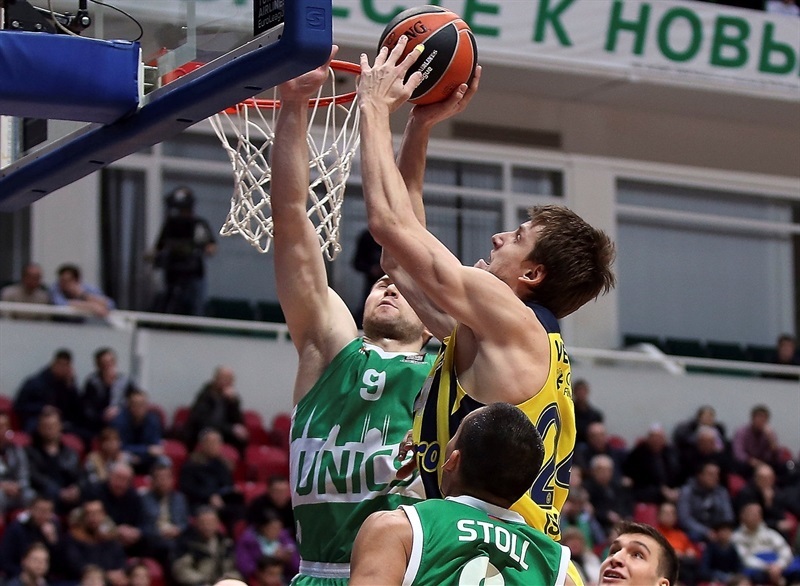 With the win, Fenerbahce improved to 5-5 on the road and 12-7 overall, while dropping Unics to 7-12. 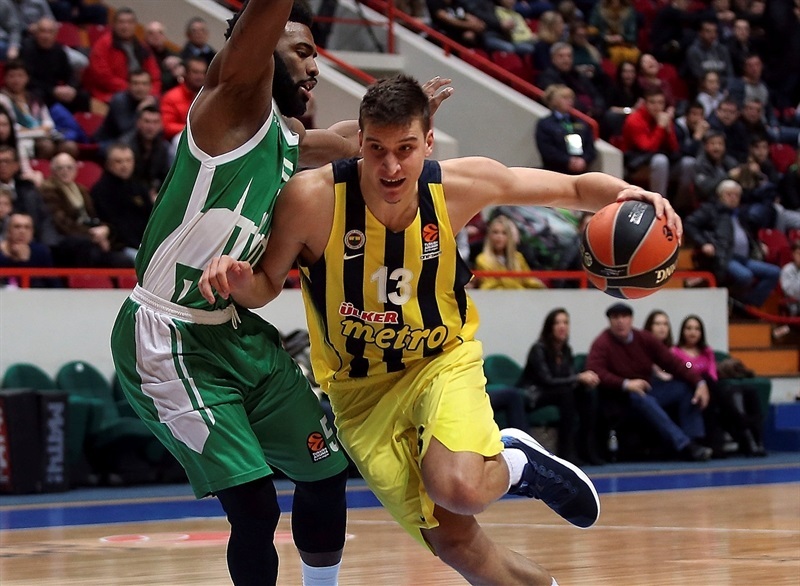 Luigi Datome paved the way with 18 points on near-perfect shooting, Bogdan Bogdanovic tallied 16 points and 7 assists, Jan Vesely scored 15 before fouling out and Kostas Sloukas added 12 points and 6 assists. 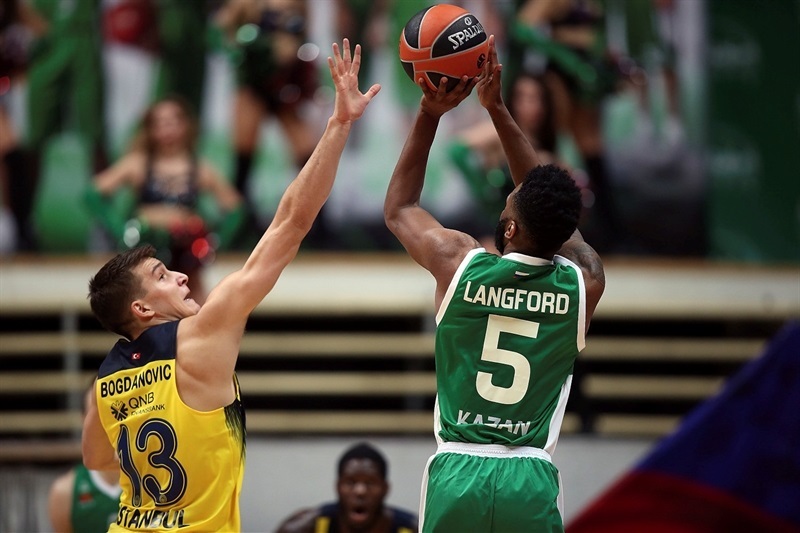 Fenerbahce did a wonderful job of defense on Keith Langford, the league’s leading scorer, who was held to just 11 points without a single two-point shot attempt. Art Parakhouski stood tall with 21 points on 8-of-10 shooting plus 9 rebounds for Unics and Orlando Johnson set a career-best with 16 points. 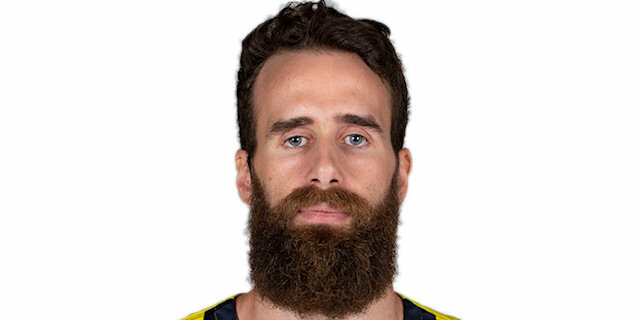 Fenerbahce attacked the rim early to get its first 5 points through Vesely before Datome drew Parakhouski’s second foul just two and a half minutes in. Unics fought back from an early deficit through a pair of threes by Paul Stoll and another from Kostas Kaimakoglou to tie the game at 11-11. Back-to-back threes by Sloukas and James Nunnally put the visitors back in control at 11-18, which prompted a Unics timeout. Vesely came back in after a brief rest and boosted his team to 15-22 after 10 minutes. The lead reached double figures after Anthony Bennett, in his EuroLeague debut, made a steal and a long assist for a Nunnally slam and Sloukas added free throws to make it 17-28. 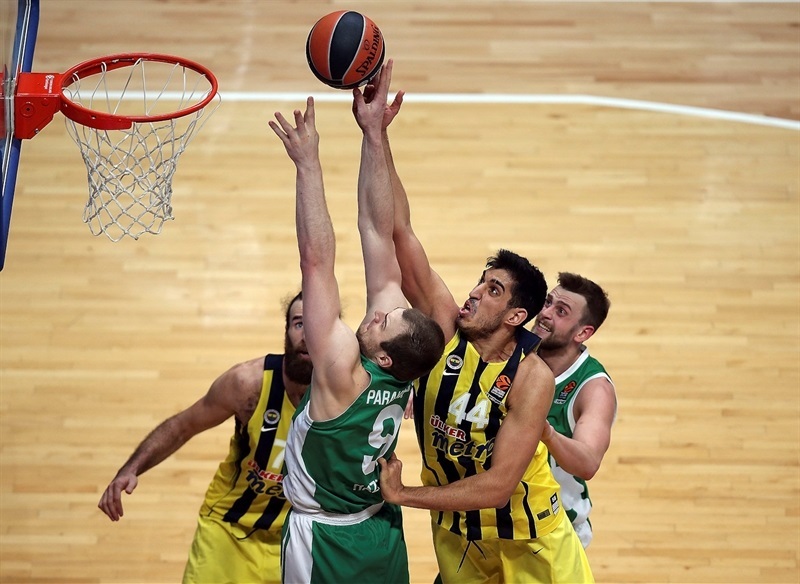 Parakhouski tried to revive the Unics with a block, a put-back and a free throw. Back-to-back triples from Pavel Antipov and Langford – the first shot attempt for the latter – closed the gap. Langford added free throws, an assist to Parakhouski and more free throws to cap a 12-2 run that gave Unics a 34-32 edge. However Bogdanovic responded with a three-pointer and Datome scored twice in a 0-7 push that put the visitors ahead 34-39 at the break. Bogdanovic scored 4 quick points and drew Parakhouski’s fourth foul in the first minute of the second half. The hosts battled back twice to get within 4, but a three by Bogdanovic capped a 0-8 run to restore a double-digit lead, 42-54. 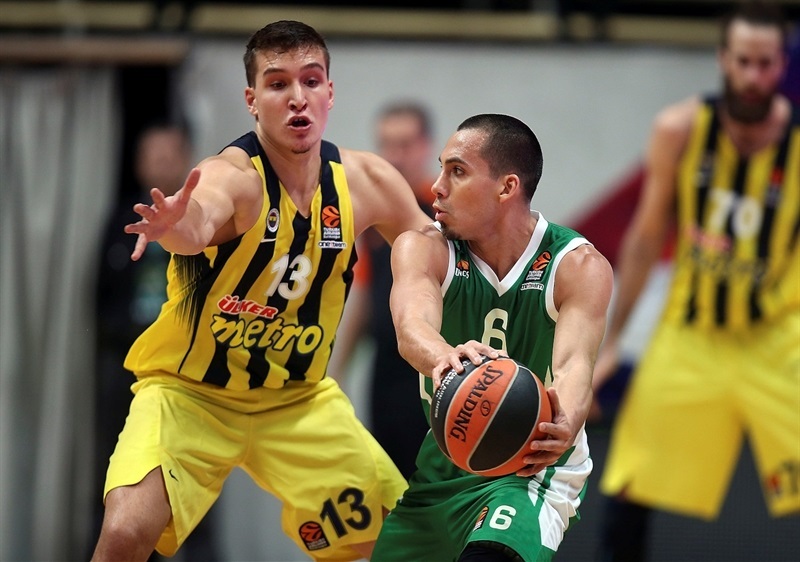 Johnson and Parakhouski, each with a basket-plus-foul, kept Unics alive, 54-60. 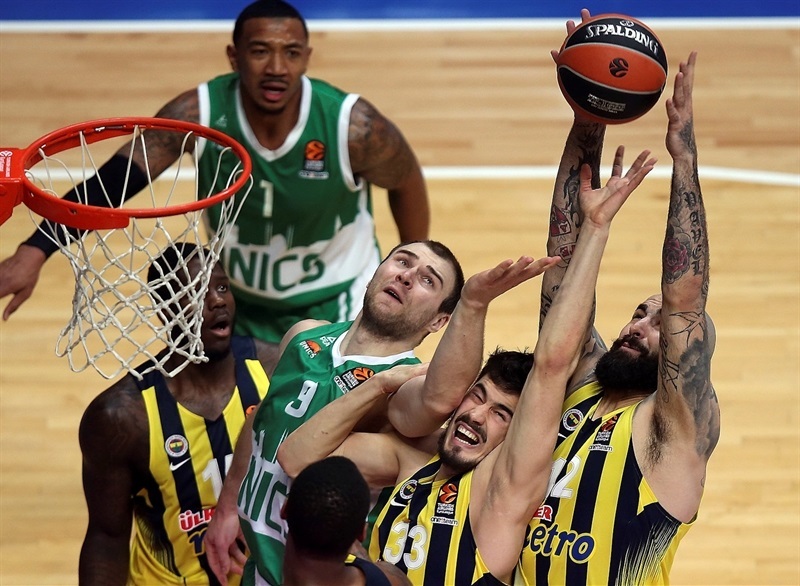 Threes by Datome and Nunnally kept Fenerbahce in control, despite points for Unics by Johnson. Parakhouski free throws ended the third quarter at 60-68. After a three by Johnson and alley-oop and foul by Parakhouski, the gap was 2. However Pero Antic drilled a pair of threes in a 0-8 charge to make it 66-76. Unics fought back to within 76-79 with 4 straight points from Coty Clarke. Fenerbahce looked to pull away, but Langford buried a big three to make it 81-84 with less than two minutes to go. 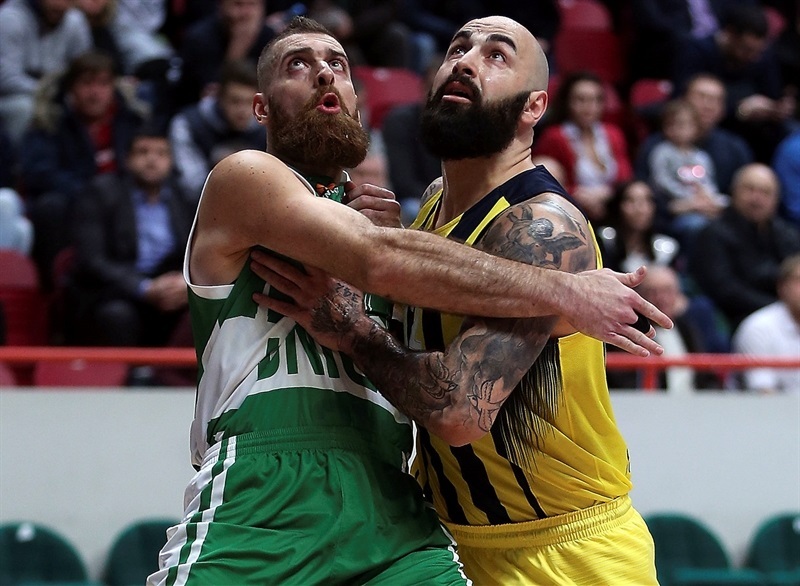 Johnson added a stunning block to keep the hosts within 3, but Ahmet Duverioglu free throws made it a 5-point game with 36 seconds remaining and Fenerbahce denied Unics on its final two possessions. "The game was tough for us. 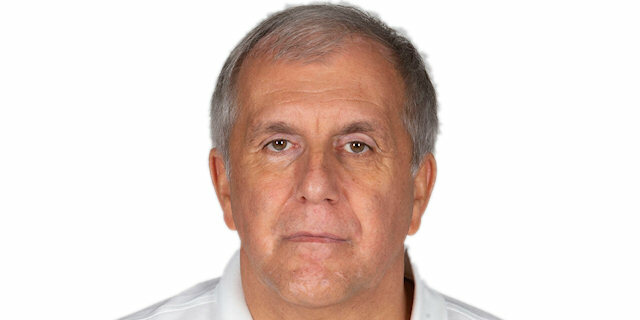 Fenerbahce is a very good team and they have a long roster. We expected [it would be] so hard defensively because we watched their last game against Panathinaikos which they won by 20 and we prepared for that, but mentally we were not able to react and we got 11 turnovers in the first 20 minutes. Even some times unusual turnovers, not because the pressed us. That is I think what allowed Fenerbahce to lead by 5 points. After that in the third quarter we continued to play random, not team basketball, because they pressed us. End of third quarter and fourth quarter, we were much better on defense and we started to press them when we had the lineup with Voronov, Clarke, Johnson, Antipov and the experience of Parakhouski. We started to rise up the defense and play harder and more aggressive. And also we forced Fenerbahce to play isolation more, which destroyed their offense. We were down 15 and this gave us the opportunity to get back. We were down 3 in the middle of the fourth quarter and we made two mistakes with shots from the corner for Datome and Nunnally. The game was in our hands. I think we have to play all 40 minutes like this, like we played the last quarter and end of the third, with more energy. We have to play aggressive defense, rebound, stop people and share the ball offensively. " 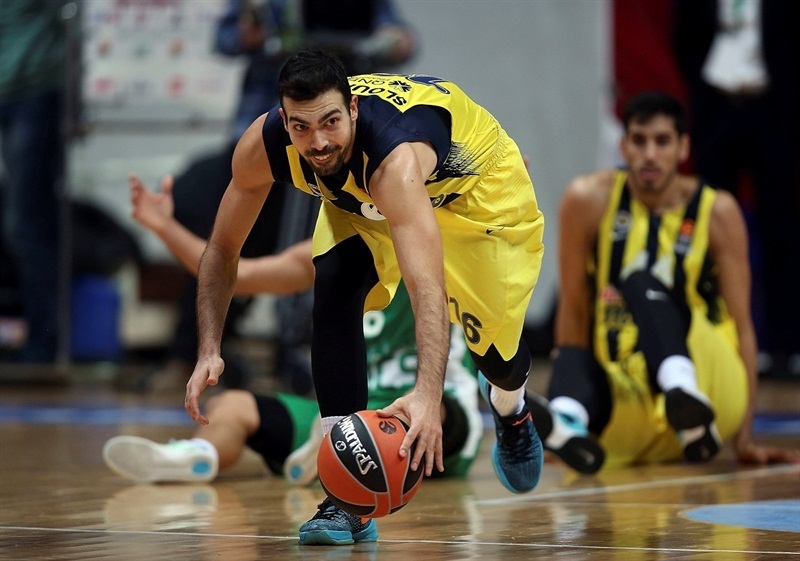 "After the first round we lost the game in Istanbul we understood very well the quality that Unics has, so it was necessary to play a good game to win. We controlled the game from the beginning to the end, except for some minutes in the second quarter when they came back. We have a lot of up and down in our game. Some players play basketball, but some play like it is the first time they take the ball to the basket. Everything is about concentration and decisions. I agree that if we play 40 minutes with concentration, we are a very good team. If not any team will beat us very easy. However a very good victory for us. 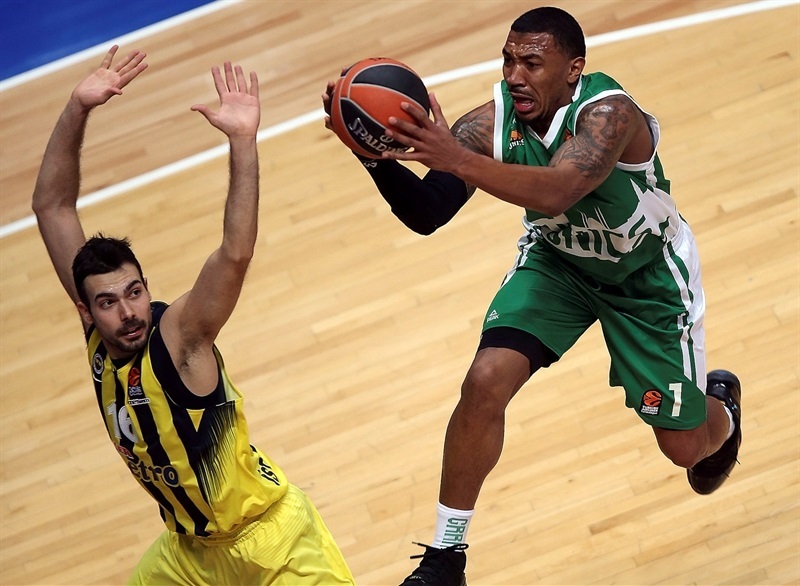 We know that [Keith Langford] is a very important player for Unics, the best scorer in the EuroLeague. Until now he has averaged every game almost 18 shots and 8 free throws. So on that I am very happy because we kept all his numbers down, but this only part of the game. As I said before the game, it is not only Langford. One more time, Parakhouski played an excellent game against us. Everything that he takes, he scores, very easy and very cheap baskets. So it is not only a matter of one player, you must defend the whole team. " " The key was to stay focused with our game plan. We knew their key offensively, and my teammates had a great effort the whole game. We had a problem with the big guys, Jan had foul trouble, so everyone had to help on rebounds. We played solid. That’s what we try to do every time, and tonight we did it. Keith Langford is a very good player, very important for them and they look for him a lot. My teammates did an incredible job, incredible effort, not only guarding him, but everybody helping defensively, too. He is a talented guy, and on that point we did a very good job."